Suddenly, critical reviews of the highly problematic 2011 Shalit Deal are all over the social media. We raised the issue yesterday ["19-Jul-15: Another catastrophic outcome of the 2011 Shalit Deal"] as soon as we learned that the Palestinian Arab terror gang that executed a shooting attack on a car-load of young Israeli men heading home from a basketball game last month were organized, funded and led by one of the many hundreds of convicted murdering terrorists who walked free in the Shalit Deal. Sunday’s arrest of the suspected killers of Malachi Rosenfeld, who was murdered in a drive-by shooting near the West Bank settlement of Shvut Rachel last month, once again highlighted the ever-growing price of the 2011 prisoner exchange that freed kidnapped soldier Gilad Shalit. Almost four years after that deal, in which Israel freed 1,027 terrorists to get Shalit back, even those who supported it – primarily on the grounds that Israel had an obligation to its soldiers – are obliged to acknowledge its negative aspects. And it must be admitted that these weren’t unforeseen. "Must be admitted... weren’t unforeseen". Those are some weighty, consequential words. Those who supported it and are obliged to acknowledge its negative aspects include (with some small exceptions) every part of the Israeli print and electronic media, Haaretz included. (But allow us to pay tribute once again to the late David Landau who edited Haaretz for a time and whose views were courageously different). until an Israeli leader comes along who finally puts a stop to these these dangerous, delusional transactions, there will be only more kidnapping attempts... [W]as Gilad Shalit’s blood redder than the blood of the six people subsequently murdered as the result of the deal for his release? Is it redder than the blood of the additional victims who will inevitably and tragically be murdered? Shouldn’t Netanyahu have taken a far tougher stance with Hamas in order to get them to climb down from their demand for a thousand prisoners? Perhaps even more ridiculous is the fact that the Israeli public accepted the Shalit deal with near total understanding. That "near total understanding" was the outcome of a process about which we have written and spoken, but it's not our theme here today. "20-Jul-11: How the media hijacked the campaign to free Gilad Shalit"
"15-Oct-11: From today's NY Times: "This deal is a disaster""
"15-Oct-14: Things we learned (or should have) during the last 3 years about dealing with terrorists"
"27-Jul-13: To defeat the terrorists, what one thing must a government never do?" "18-Oct-11: "The statistical likelihood of more murders in the wake of a mass release of terrorists... is a certainty""
But there is one mainstream Israeli media voice, that of Haaretz's Ari Shavit, with whom we certainly have our differences, that expressed back then, almost in real time (though only after the deed was done) horror at the widespread craziness that had brought Israel's government to a transaction steeped in yet-to-be-shed blood with murderers already mired in evil and hatred. This is an important morning for the Shalit familt and for the State of Israel. A first morning after the insanity. A first morning after the hysteria. A first morning after the loss of judgment and the loss of our senses. For Gilad Shalit, this morning is a first morning. It is a first morning of freedom, a first morning of sanity, a first morning of love and of warmth. A first morning after the captivity, a first morning after the isolation, a first morning after the nightmare. After 1,941 days and 1,941 nights in a dark pit, Gilad awakes this morning into a great light. Mother, father, brother, sister. Mitzpeh Hila, the Upper Galilee, Israel. There are finally vast blue skies of freedom above his head. But this is an important morning for the State of Israel, too. A first morning after the insanity. A first morning after the hysteria. A first morning after the loss of judgment and the loss of our senses. After 1,941 days and 1,941 nights dominated by kitsch, this morning we are waking up to reality. Opening our eyes and rubbing them to see who we are and what has happened to us. This morning, when Gilad Shalit wakes up in his bed, we can already tell the truth: We went crazy. During the past 64 months, we simply went crazy. Because of the profound and justified guilt that we all felt for one boy and one family, we stopped acting in a reasonable manner. Because of the twisted awareness that we suffered in the era of Channel 2, we worked ourselves up into an emotional frenzy. We reached the point where we are willing to sacrifice hundreds whose names and faces we are not familiar with, in exchange for the one whose name and face have become a part of our lives. We reached the point where we conduct our national affairs like children - without wisdom, without morality and without mature responsibility. We should recall: Yoni Netanyahu also had a family. A mother, a father, two brothers. Yoni Netanyahu also had a home, and there was love and there was a full life. But the State of Israel decided to risk his life in order to save the lives of its citizens and in order not to surrender to terror. The State of Israel sacrificed him for the general good of the Jewish people. In that, Yoni was not exceptional. In the past 75 years we sent thousands to their deaths and hundreds into captivity in order to protect life. We did not focus cameras on every bereaved father and every bereaved mother. We did not weep at the sight of every young man who packed his knapsack and set off for war. We did not emotionally collapse in the face of the young lives that were lost. We understood and remembered the cruel imperative of our lives here. That's how we won in 1948, in 1956, in 1967, that's how we survived in 1973 and after 1973. The Yoni ethos was our daily lot before and after Yoni. He built the iron security wall, and only thanks to that are we able to live an almost normal life here. The great danger in what has happened here in recent years is the replacement of the Yoni ethos with the Gilad ethos. The Shalit family is not to blame for that. The boy Gilad is certainly not to blame for that. But there was an unprecedented hysteria surrounding the noble family and their son. Restrained judgment was replaced by emotional abandon. The universal discussion was replaced by an individual one. Standards were lost and criteria were lost and rules were broken. In the end, the practical justification for the Shalit deal was a reverse justification. We had to end the craziness. We had to stop the national hysteria. We had to interrupt the interminable reality show of Channel 2: kitsch and captivity. But now, the morning after, we have a duty to make it clear that there will not be another such reality show here. 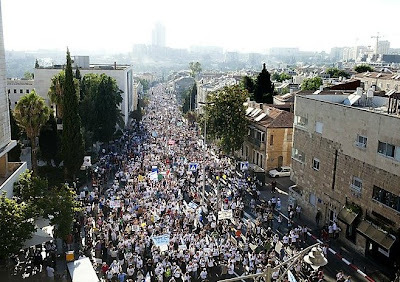 There won't be another Shalit deal and there won't be another Shalit-frenzy. From now on, Israel will behave like Australia, Great Britain and the United States. From now on, Israel will once again be what it used to be. The Shalit decision is the most difficult leadership decision Prime Minister Benjamin Netanyahu has made to date. Now he faces an even more difficult decision: Netanyahu must pass the recommendations of the Shamgar Committee in the cabinet, in the Knesset and among the public. Netanyahu must place our mutual responsibility on a wise, moral and inclusive foundation. Netanyahu must bring us back from the Gilad ethos to the Yoni ethos. In order for us to withstand the heavy losses of the coming wars, we must return to sanity. Already now, already today. This morning is the first morning. That Ari Shavit was unjustifiably generous to the late Yoni Netanyahu's politician brother is borne out by the way he, the brother who became prime minister, then went on to do several more rounds post-Shalit of dealing in our names with the terrorists ["21-Oct-13: Incredibly, maddeningly, convicted terrorists are about to be freed again"], and delivering them up into the arms of those, the Mahmoud Abbas cabal who control the 'moderate' Palestinian Authority, for whom the killers of elderly Jews and of children ["14-Aug-13: Making 'peace' by celebrating the murders of children and of Holocaust survivors"] are heroes, nobility and celebrities.